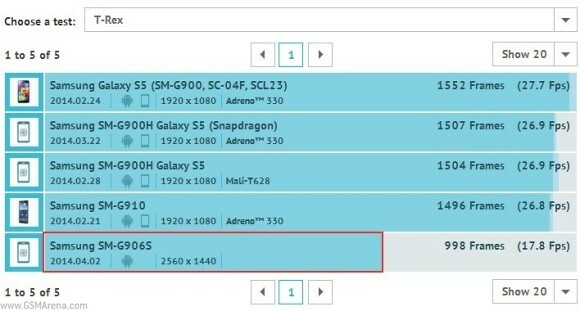 A new Samsung device has cropped up on GFXBench's device list. The device goes by the name SM-G906S, which is quite similar to the Galaxy S5 model name (SM-G900 for the international Snapdragon-powered version). The SM-G906S sports a QHD (2560 x 1440 pixels, Quad HD or 1440p) display, but that's just about all the info of the device we got from its info page. Well that and the offscreen scores in posted on GFXBench's T-Rex and Manhattan tests. More importantly we don't see the graphics processing unit on the SM-G906S and therefore cannot say if it will be a Qualcomm or Exynos-powered device. T-Rex shows a score of 17.8 fps, almost 10 fps lower than the Adreno 330-powered Galaxy S5. The more gprahic-intensive Manhattan still puts the SM-G906S lagging behind the Snapdragon-powered Galaxy S5 but shows it beating the Exynost-powered one. Of course, the Galaxy S5 is a finalized smartphone that's just about to hit the shelves, while this G906S device is still in development, so we'd advise against reading too much into those scores. Perhaps this is the higher-grade second variant of the Galaxy S5 that we didn't get to see unveiled at the Mobile World Congress? Samsung has denied it so far but one could still hope. 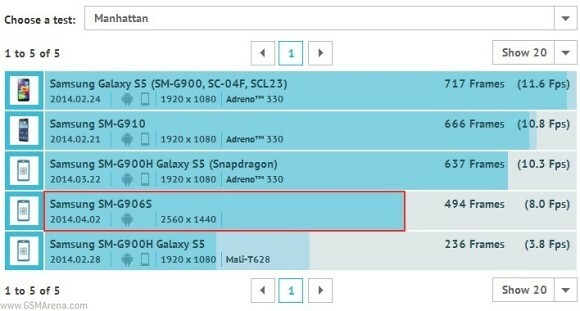 There were whispers of an QHD-packing Galaxy S5 on AnTuTu but that device carried the model name SM-G900R4 and not SM-G906S. We know the company will be releasing a mini, Zoom and possibly Active version of the Galaxy S5 flagship. Plastic sells to those that don't know any better. Luckily I never pre-order S5. can wait for this!